Sadly, our organist has retired. If anyone reading this would like to offer their services, on either the organ or the piano, please prayerfully consider doing so and contact us. 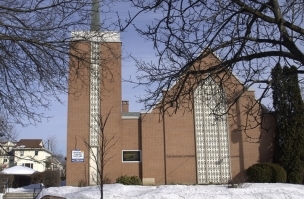 Holy Communion celebration is each Sunday at 9am Are you looking for a Traditional Christian Church in the Ottawa area? Come worship with us! We are settled into our new home at 715 Roosevelt Avenue, where Our Savior Lutheran Church has graciously accomodated us. The facility is wonderful, especially for a congregation which worships in the time honoured way of the original Anglican Church Sunday celebrations of Holy Communion begin at 9am. The Healing Service follows on the first Sunday of each month. Please join us at: 715 Roosevelt Ave‎ Ottawa, ON K2A 2B8 NEED DIRECTIONS? Our Ash Wednesday Service will be at 3:30 pm. Please join us.